The jaguar (Panthera onca) struck fear, awe, and reverence into the Aztec and Mayan civilizations that elevated the big cat to deity status in pre-Columbian North America. The supple jungle creature has more recently served as muse to biologist Alan Rabinowitz, CEO of the nonprofit, wild feline–focused conservation organization Panthera. And the jaguar inspired his latest book, An Indomitable Beast. In the book, Rabinowitz briefly recounts his own transformation from a child with a debilitating and isolating stutter to a preeminent big-cat conservationist, with jaguars as his pseudospiritual guides. But he spends the bulk of the book detailing the rise and fall of the jaguar: from Pleistocene Eurasian immigrant to the New World, to Mesoamerican god, to beleaguered predator. Positing the jaguar as sort of a conservation poster cat, Rabinowitz relates the latest research on its dwindling populations and how novel management strategies may help return the animal to its former dominance. The Jaguar Corridor Initiative, he explains, stretches from Mexico to Argentina and focuses not only on protecting the species and its local habitats, but also on maintaining habitat corridors—highways that con­nect different populations to facilitate gene flow and overall diversity. Even the most serious scientific mind is sometimes host to a ridiculous question: Is it possible to build a jetpack using downward-firing machine guns? 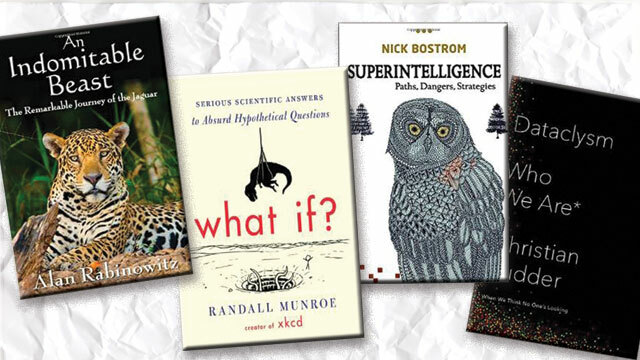 Webcomic artist and erstwhile NASA roboticist Randall Munroe saves intelligent minds the trouble of all that daydreaming and compiles a list of some interesting, if trivial, questions of this ilk in his latest book, What If? Creator of the delightfully minimalist webcomic xkcd, Munroe answers a whole host of hypotheticals—posed by his loyal fans—with his characteristic blend of humor, scientific accuracy, and, of course, stick figures. While to some it may seem a frivolous read, the book is actually quite informative, as Munroe uses the often absurd questions as jumping-off points to explain substantive physics, geography, history, meteorology, and biology concepts. The author also paces the book nicely by varying the length of his answers: some take pages of text and images, others are dispatched in a single drawing, while some are not answered at all, as Munroe lets the ridiculousness of those questions (e.g., “What if every day, every human had a 1 percent chance of being turned into a turkey, and every turkey had a 1 percent chance of being turned into a human?”) speak for themselves. We’ve all seen the futuristic films, read the sci-fi novels, and binge-watched the television series that warn of a coming age when machines will conquer humanity and rule the Earth. But this scenario gets a more scientific treatment from Oxford University philosopher and futurist Nick Bostrom in Superintelligence. The time is ripe to stop fantasizing and start strategizing, Bostrom warns, because the arrival of an intelligence greater than that possessed by humanity is upon us. Deftly skirting the line between fear-mongering and realism, Bostrom tells a measured tale of the actual research going on in tech labs around the world to bring about artificial intelligence and engages in thought experiments that aim to predict and react to the inevitable emergence of robots that are smarter than we are. Potential dangers include such things as self-interested computers hoarding resources to the detriment of humans, but Bostrom engenders hope that careful planning and thoughtful science can subvert even the most far-fetched, robotic catastrophe. As the uproar begins to subside over Facebook’s covert co-opting of its users’ activities to conduct “emotional contagion” research, Dataclysm celebrates the approach. Author Christian Rudder, cofounder and president of the Internet dating site OkCupid, expresses barely restrained exuberance at the potential to access gobs of data, submitted by millions of people around the globe. Rudder illustrates that potential as a way to move beyond the confines of the laboratory in the quest to understand human behavior. Facebook likes can predict intelligence and even sexual orientation, tweets can chart the dynamics of group rage, etc. But the question is: Can we protect privacy while tapping into this vast reserve of human behavioral data? This may or may not be possible, Rudder argues, depending upon how gatekeepers, such as the National Security Agency and Facebook, choose to behave.